There are no events scheduled for this weekend. 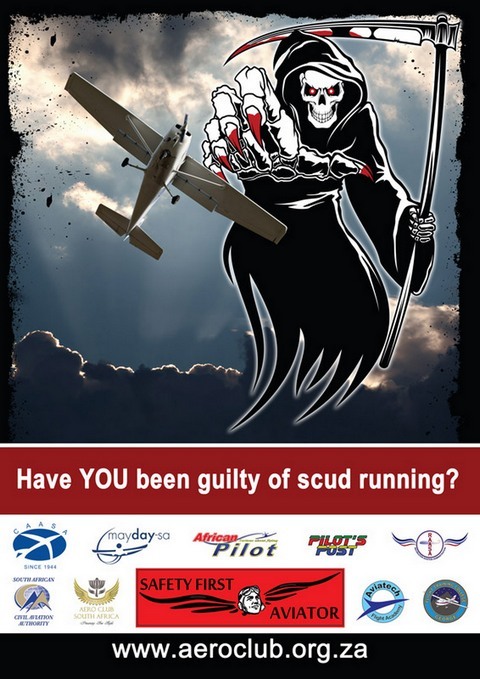 31 January to 02 February: Dias Festival airshow - Mossel Bay. On Thursday 2nd January 2014 Airbus rolled-out its third A350 XWB flight-test aircraft, MSN2, from the paint shop in Toulouse, marking yet another successful milestone on the path to entry-into-service in Q4 2014. As well as featuring a distinctive "Carbon" signature livery to reflect its primary construction from advanced materials, this aircraft is also the first of two A350 flight test aircraft to be equipped with a full passenger cabin interior. Composite materials in Airbus aircraft have seen a step-by-step introduction that started with the A310 which was first rolled-out in February 1982. Benefiting from over 30 years of composite material experience, 53% of the A350 XWB's airframe is made-up of carbon-fibre reinforced polymer (CFRP) including Airbus' first carbon-fibre fuselage. SEATTLE, Jan. 4, 2014 /PRNewswire/ -- Boeing (NYSE: BA) has flown the 787-9 Dreamliner to Auckland, home of launch customer Air New Zealand, marking the 787-9's international debut and longest flight since the robust test program began. The second of three 787-9s dedicated to the flight-test program, ZB002 flew direct from Seattle's Boeing Field to Auckland International Airport, departing January 3 at 9:55 a.m. local time and landing (shown here) some 13 hours, 49 minutes later. The airplane is scheduled to continue on to Alice Springs, Australia, for testing in hot weather. 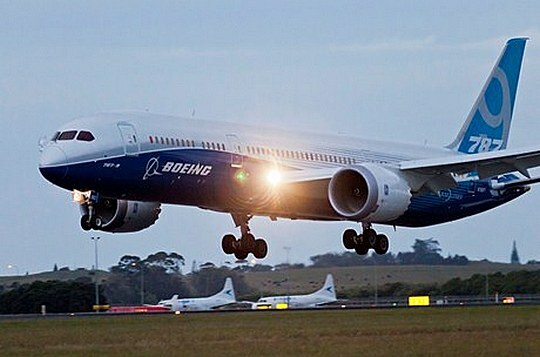 The 787-9 will complement and extend the super-efficient 787 family. With the fuselage stretched by 20 feet (6 meters) over the 787-8, the 787-9 will fly up to 40 more passengers an additional 300 nautical miles (555 km) with the same exceptional environmental performance - 20% less fuel use and 20% fewer emissions than similarly sized aircraft. The 787-9 leverages the visionary design of the 787-8, offering passengers features such as large windows, large stow bins, modern LED lighting, higher humidity, a lower cabin altitude, cleaner air and a smoother ride. Boeing is on track to deliver the 787-9 to launch customer Air New Zealand in mid-2014. Twenty-six customers from around the world have ordered 402 787-9s, accounting for 39% of all 787 orders. 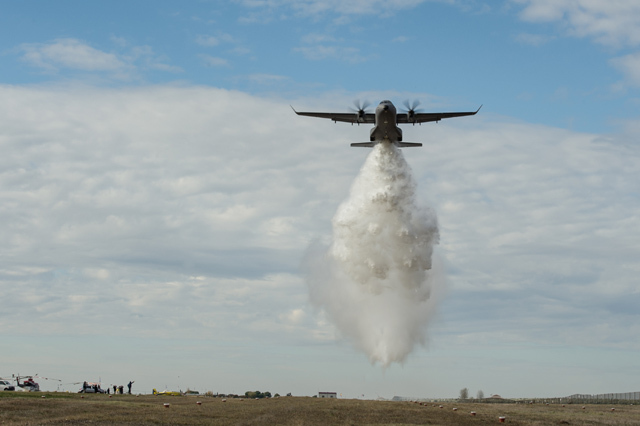 Airbus Military has completed a second round of tests of its prototype C295 fire fighting aircraft which will provide detailed data on the performance of its water dropping system. Following earlier testing of the system, the company conducted seven water drops at a special range near Cordoba, Spain using ground equipment designed to measure the dispersal pattern of the water. The trials were successfully completed and showed good initial promise, confirming the aircraft's highly satisfactory handling during the drop procedure. In the coming weeks the data will be examined in detail to enable decisions to be taken on the final configuration of the C295 fire-fighter. In the trials the aircraft carried one 3,500 litre tank and the water was gravity-ejected through two dispensers in the belly. The planned configuration would offer double that capacity with two 3,500 litre tanks being deployed using a roll-on/roll-off system which would permit the aircraft to be used for transport purposes when not required for fire fighting duties - greatly increasing its cost-effectiveness. Jeronimo Amador, Airbus Military HO Market Development, Light & Medium aircraft said: "We are pleased with the progress of the testing we have performed so far and very encouraged by the results. We will now analyse the data in greater detail and intensify our contacts with potential customers interested in the C295 as a fire-fighter. A roll-on, roll-off solution based on this highly flexible aircraft has excellent potential to address the financial challenges faced by authorities responsible for aerial fire fighting worldwide." The new generation C295 is the ideal aircraft for defence and civic missions to the benefit of society, such as humanitarian actions, homeland security, and environmental surveillance. Thanks to its robustness and reliability, simple systems, and optimal cabin, this medium sized tactical airlifter provides wide versatility and flexibility, necessary for personnel, troop and bulky/palletized cargo transportation, casualty evacuation, communication and logistic duties, and air-dropping. Its flexible design, long endurance and modern systems have made it an outstanding platform for a wide range of ISR roles including anti-submarine and ship warfare, airborne early warning, and maritime surveillance. The C295 is part of Airbus Military's family of light and medium airlifters which also includes the smaller NC212i and CN235 platforms. In the fourth quarter of 2014 Airbus Military will introduce the C295W, featuring as standard winglets and higher engine power ratings, giving increased performance in all flight phases and lower fuel burn. AgustaWestland, a Finmeccanica company, is pleased to announce the Italian Police has taken delivery of a fifth AW139 intermediate twin engine helicopter which will be based in Reggio Calabria. The contract, which was signed in July last year, includes a total of eight AW139 helicopters. Designated UH-139C, the Italian Police's helicopters operate from bases in Southern Italy (Bari, Palermo and Reggio Calabria) as well as from Pratica di Mare close to Rome. The Italian Police AW139 configuration includes a high definition latest generation FLIR, satellite communication system, searchlight, rescue hoist and a cabin mission console. 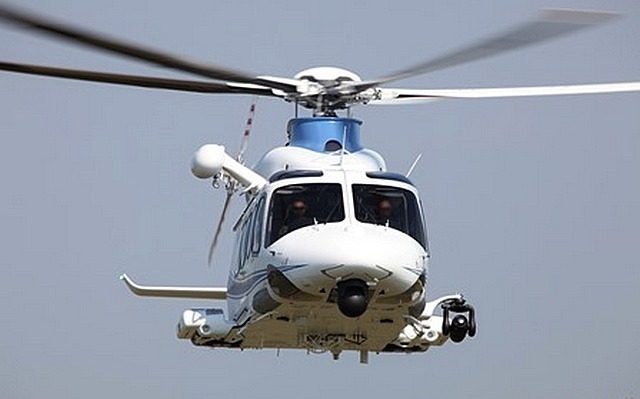 The latest aircraft also includes an advanced HD video down link which will also be retrofitted to the Italian Police's UH-139 helicopters already in service. The AW139 was chosen by the customer after a comprehensive evaluation process of competing bids, proving the AW139 to be the best value solution to meet its demanding mission and safety requirements. The replacement of old helicopter models with AW139s, partially funded by the European Union Frontex programme, supports the fleet modernization plans of the Italian Police and will benefit the communities they serve. The AW139 has also been selected by and is in service with the Italian Coast Guard, Guardia di Finanza (Customs and Border protection) and the Italian Air Force. The various Italian Government agencies operating the AW139 are able to benefit from shared logistics, training and support systems. The contract signed by the Italian Police brought the total number of AW139s chosen by all of these Italian government operators to 31, covering a wide scope of public utility roles including law enforcement and homeland security, patrol, special operations, search and rescue, command and control, government/VVIP transport, disaster relief and training. The AW139 is the world's best-selling helicopter in its class and the only new generation aircraft in its weight category in service today. Over 200 customers from almost 60 countries have ordered more than 750 AW139 helicopters to perform a wide range of roles including law enforcement, homeland security, border/coast guard duties, emergency medical services, fire fighting, search and rescue, VIP/corporate transport, offshore transport and passenger shuttle services. A growing number of law enforcement and border security agencies have selected and operate the AW139 in countries such as the USA, Japan, Oman, Brazil, The Netherlands, Republic of Korea, Malaysia, UAE and China. Botucatu, S�o Paulo, Brazil, December 16, 2013 - The Ipanema agricultural airplane achieved a historic 1,300 units delivered, today. After more than 40 years of uninterrupted production, the aircraft continues being a best-seller: in 2012, 66 Ipanemas were sold to customers in Brazil and the Mercosur community, for an increase of 12% over the previous year (58 airplanes). The forecast for this year is that 70 aircraft will be delivered. "The perpetuity of the Ipanema program is based on its reliability and efficiency," says F�bio Bertoldi Carretto, Embraer's Sales Manager for the Ipanema. "Over the years, improvements and advances have been incorporated, aligned with the needs and demands of customers, which has ensured the aircraft's leadership position in its market segment." The commemorative aircraft is the eighth delivered to Fort Avia��o Agr�cola, since 2007, when the company was founded, with headquarters in the city of Rio Verde, in outstate Goi�s. 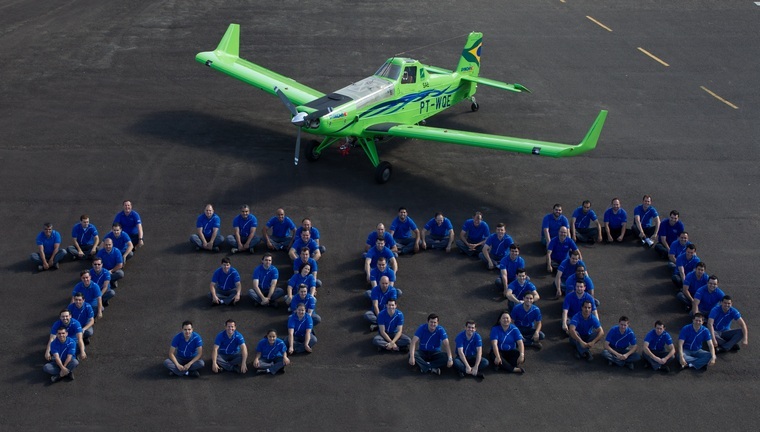 "We work only with Ipanema airplanes, because we opted for a nationally built aircraft which is more appropriate for the working conditions and climate found in Brazil," states Clertan Alves Macedo, Executive Director of Fort Avia��o Agr�cola, which has recently become the first company in its segment to receive ISO 9001 certification in the country's Midwest. "Furthermore, we chose models powered by ethanol, which has a smaller environmental footprint, higher work output, and lower operating cost." The Ipanema was the first aircraft produced in series in the world to leave the factory already certified to fly on ethanol (hydrous ethanol), which is the same fuel used in automobiles - the model has been available since 2005. 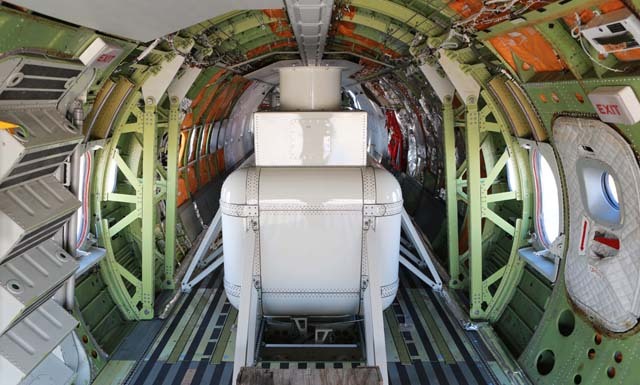 This alternative source of renewable fuel, derived from sugarcane, reduced its environmental footprint, lowered operating and maintenance costs, and improved the overall performance of the aircraft, making it more attractive to the market. Today, about 40% of the fleet in operation is powered by ethanol, and approximately 80% of the new airplanes are sold with this configuration. The leader of the agricultural aviation market in Brazil, with a 65% share, is used mainly for spraying fertilizers and pesticides, thus avoiding losses due to crushing the crops, while making operations more flexible. It can also be used to spread crop seeds, fight fires, seed rivers, and fight pests and larvae. The main crops that have demanded the use of the airplane are cotton, sugarcane, citrus fruits, eucalyptus, corn, soy, and coffee.